It is time for more photos! I have now managed to upload the rest of the photos for the first Viktorias crew. I am not entirely happy with some of them, but I've worked them enough I don't think I can improve without a full scrap and redo. 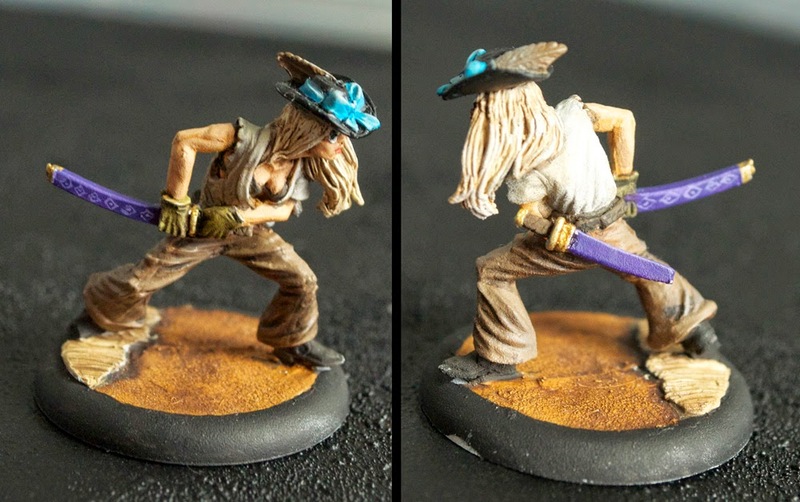 First the ronin: I had to convert her hat to the one that comes in the accessory blister. The dinky little cowboy hat that she has is not a period piece, it's made I think exclusively recently. The rest, to fit her cowgal motif was border town, mud floor, and plain coloured clothing. I have done some fancying up of her swords, but I wanted to make her look relatively down on her luck. As with the Ten Thunders, I decided to have a single colour used on all models in the force, and in this case it's the bright purple of her sheaths. The blue ribbon makes an appearance in one or two other places, but that purple was the one I primarily wanted everyone to have. Ronin 2 was also painted fairly plainly. 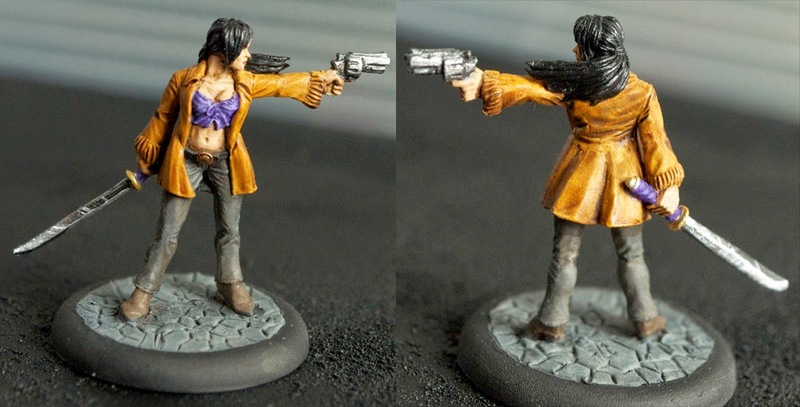 I did a few embroidered roses on her coat (perhaps one for each of her kills to date) and limited the brighter elements to a shirt and of course, her swords. 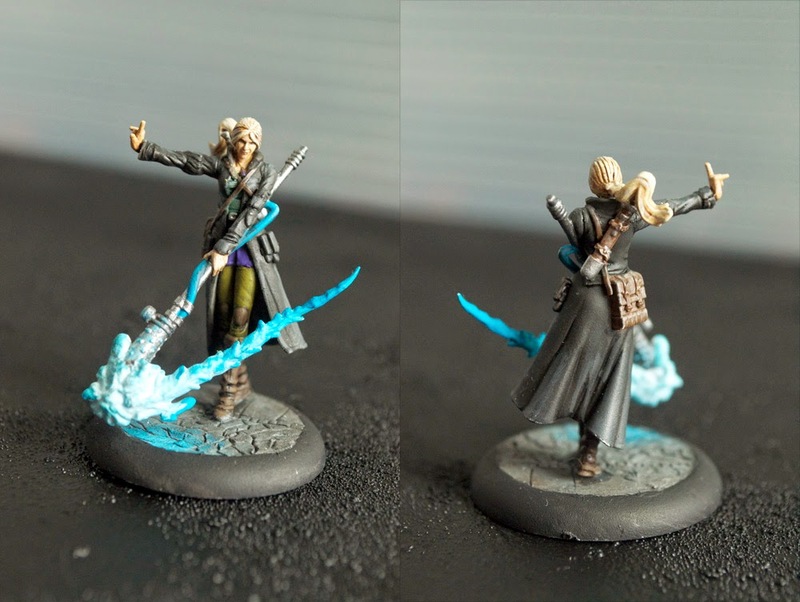 Her gloves and pants match, and her duster is basically just a browner variant of the same colour because again, I wanted them to seem rough and ready women, mostly wearing practical gear but with a splash of unique garb somewhere. Note also the dock and pool of water she's standing on! 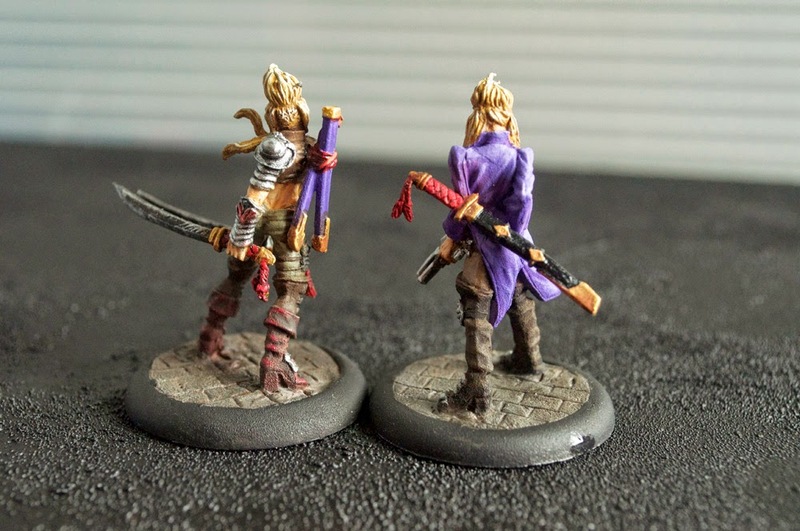 The final Ronin has the same sword painting style as the Viks themselves, and her clothes are equally mundane. Plain sturdy jacket, plain rugged pants, and with a light, possibly silken shirt. All three are mostly makeup-less as well, since one does not do fanciful makeup just to run out and smudge it in battle! By the time I was working on metal-Taelor, plastic-Taelor was already revealed, and I knew she would be the one I'd use. I don't dislike the metal one, it just doesn't seem to fit her style quite as much. She's meant to be a crass, strong, dominant woman who's good in a fight. I can't imagine any such woman wearing a shirt like this unless that's all she had left/clean. What then to do with this model? Hmm, a figure that has had to sell the shirt off her back, but still cares about the weapons that are the tools of her trade? Sounds like a desperate mercenary candidate to me! 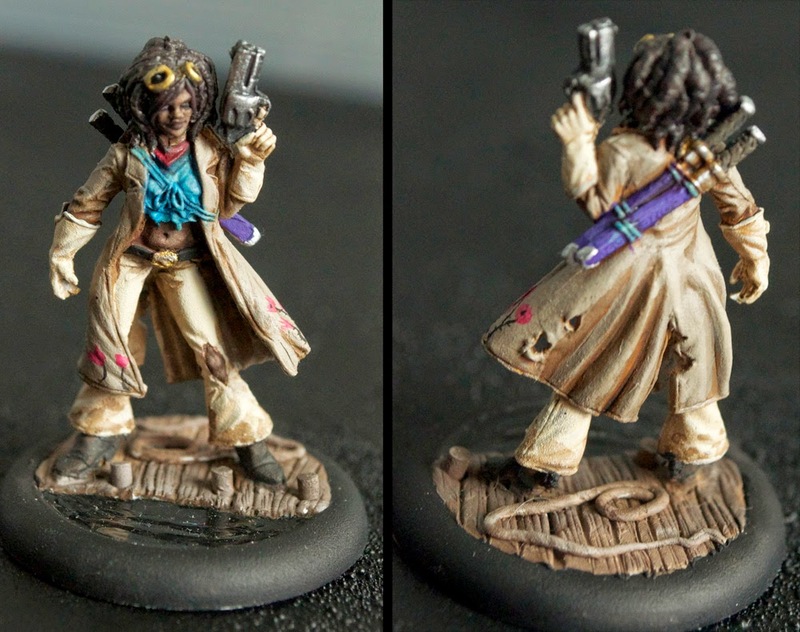 Durable denim jeans, covered with some kind of waterproofing chaps for mucking around a sewer, heavy durable boots, armour only on the side she doesn't have to aim with, and a detailed, if sturdy pepperbox pistol make the model. I used the hand from a discontinued Fantasy pikemen set, green-stuffed it to fit as a dueller's glove or a single nice thing she owns (also conveniently the purple thing for this model) and then tried to paint her skin and hair with a darker tone. I do this on purpose to make this crew as varied as possible. The three metal ronin are fairly clearly one 'white', one 'black', one south-east Asian, so with this model I have a good variety of races represented. I also like the idea of the Viks being a pair that collect to themselves the mercenaries that would otherwise not get good paying jobs (if there's still issues with income equality today, imagine then!). Speaking of, here's the ladies themselves. 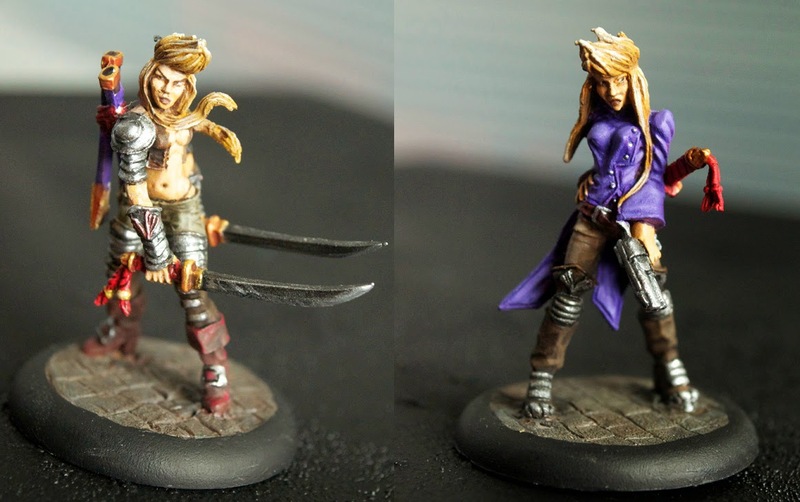 I've done the careful sword highlights, and otherwise the colour scheme is identical to the avatars. I love the poses of this pair, nicely mirroring one another like they were meant to be back-to-back. Masamune's sheath is relatively plainly painted than I was tempted to do, but with its bling in intervals down the blade, trying to do any true detail would have been frustrating. And finally, along with the Viks comes their sister, Vanessa! I know the box art has her dark-haired, but no way was I doing a black-haired sibling to two blondes! 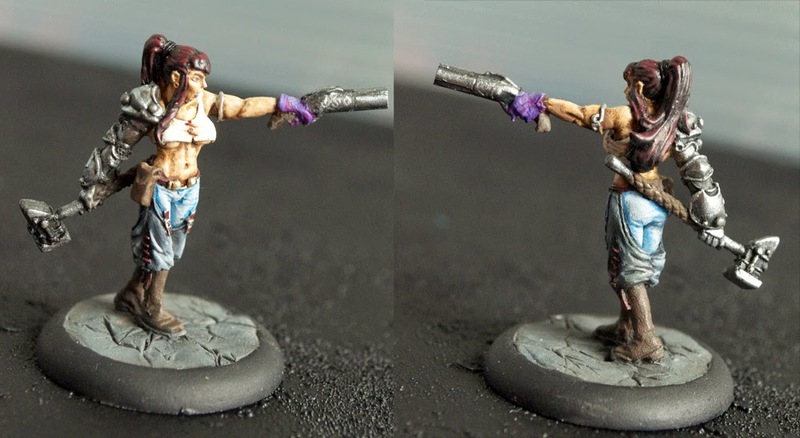 Other than that change, she too is 'rough and rugged' in painting, other than her bright glowing staff. If Wyrd keeps on the transparent model vein, I'd love to see her done with the staff at least done in clear plastic!